One of my most vivid memories monitoring the dining habits in a local elementary school here in the District of Columbia was watching my very own daughter carefully dis-assemble a made-from-scratch lasagna so she could pick out and discard the spinach and eat just the pasta and cheese. Well, guess what? Kids will eat spinach. Even my own daughter. You just have to get them involved with the cooking and make it fun, like we did this week making spinach-filled ravioli. The hardest part teaching a group of five-year-olds to cook is keeping them busy at all times. Fail that and–well, let’s just say they are easily distracted. Making ravioli turns cooking into arts and crafts. There’s so much handwork involved. Nothing terribly difficult, but enough to focus the kids’ attention and keep them involved. In this case, we make the ravioli by cranking out sheets of pasta, then creating little packages with a mix of chopped spinach and ricotta cheese. 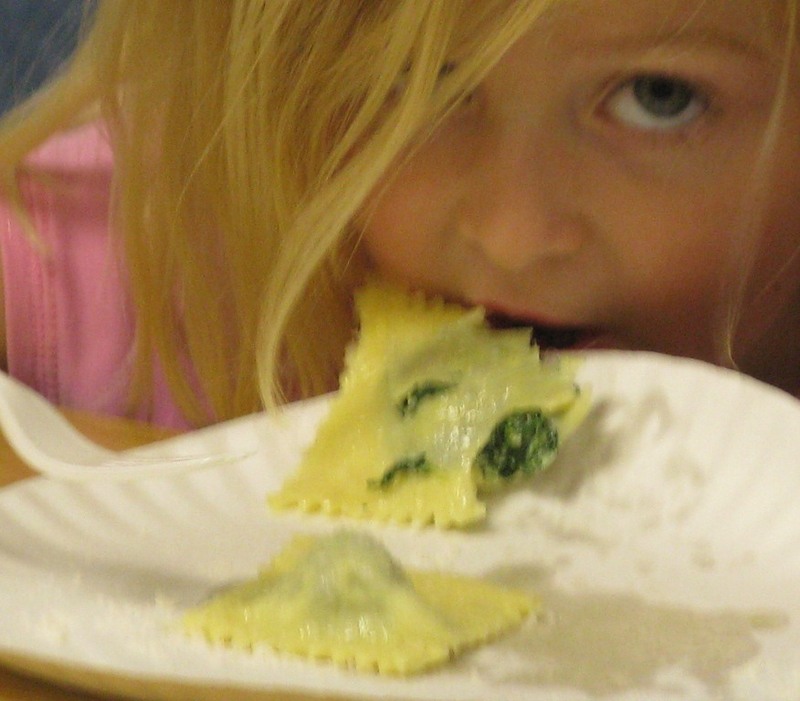 Kids use their little fingers to shape a top layer of pasta around scoops of spinach mix. Then they use a cutting wheel to separate the ravioli into individual squares. For the spinach mix, first defrost a 14-ounce package of frozen spinach and place it in a colander set over a large bowl. Frozen spinach contains a ton of water. So when it’s cool enough to handle, use your hands to squeeze out all that excess liquid. Kids love squeezing food ingredients, so this little exercise keeps them endlessly engaged. 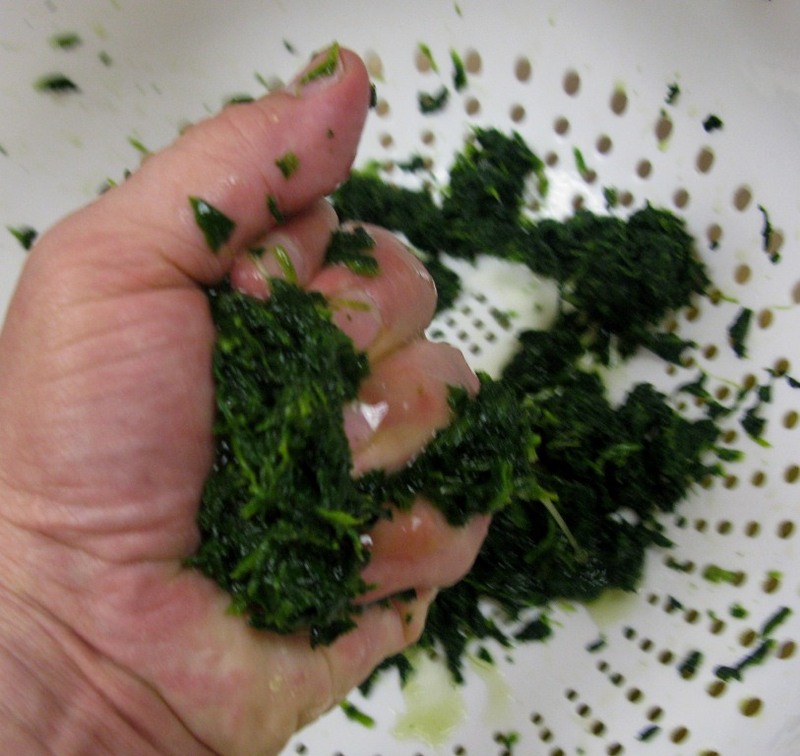 When the spinach is dry, dump it into a mixing bowl and stir in a comparable amount of ricotta cheese. Season with salt, black pepper and a pinch of nutmeg. Set aside. For the pasta, we use our tried-and-true method, pouring 2 cups of all-purpose flour into a mound on a clean work surface and using the bottom of the measuring cup to create a well in the center of the mound. Crack two eggs into the well, then use a fork to beat the eggs briskly. Continue stirring, drawing flour into the eggs until you are able to form a ball. (Don’t worry if there’s flour left over.) Knead the dough with your hands until it holds together. Divide the ball into four parts and finish kneading in your pasta machine. The dough should be smooth and elastic. In batches, press the dough through the machine to make thin sheets. Try to make the sheets wide, rather than long. Lay a finished sheet on a floured work surface. Fold it in half to mark the mid-point and cut it there to make two mirror-image pieces. 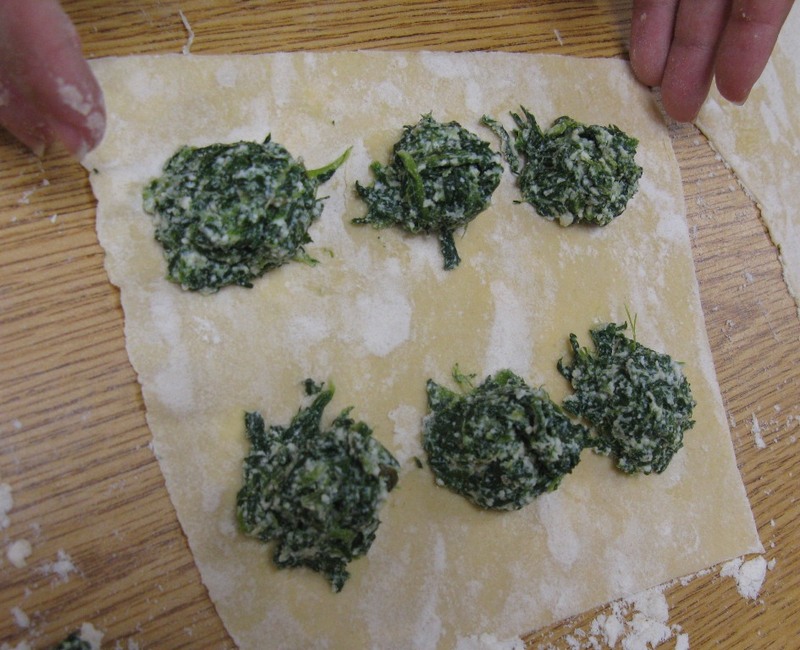 On one sheet, lay scoops of spinach mix, leaving enough space around each to form ravioli squares. Use your finger tips to shape the scoops into tidy rounds, then dip a pastry brush in water and brush the blank parts of the pasta sheet. This will help the two sheets of pasta stick together to seal your packages. Carefully lay the second sheet of pasta over the first and, using your fingers, gently press and shape the pasta around the balls of spinach, until the two sides of pasta have completely adhered. At this point, you can use a sharp knife to cut the ravioli into squares. We used a cutting wheel with a zig-zag pattern on it to create decorative edges. Now you can gently lower the ravioli into a large pot of salted, boiling water. 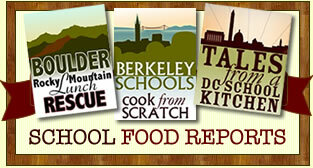 They cook quickly–it only take two or three minutes. Drain them well, then toss them in a large skillet with about 4 tablespoons melted butter. Distribute the ravioli on warm plates and garnish generously with grated Parmesan cheese. Frankly, I expected the youngest kids in my classes to reject these ravioli. Typically, they don’t care for green vegetables. But as you can see, this was so not the case. In fact, they used any means necessary to get these ravioli off the plate and into position where they could gobble them up. Looks like I messed up my first comment, so I’ll try again. 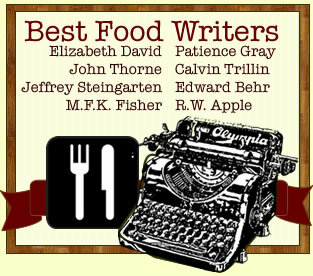 I’m delighted to find you and your blog, and especially this recipe. Any time we can encourage the kids to join us in the kitchen in preparing good food, well, that’s a win in this granny’s book. 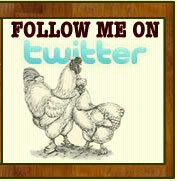 I’m sharing this as my Recipe of the Day on my social networks today. Thank you for being there. I look forward to more from you.